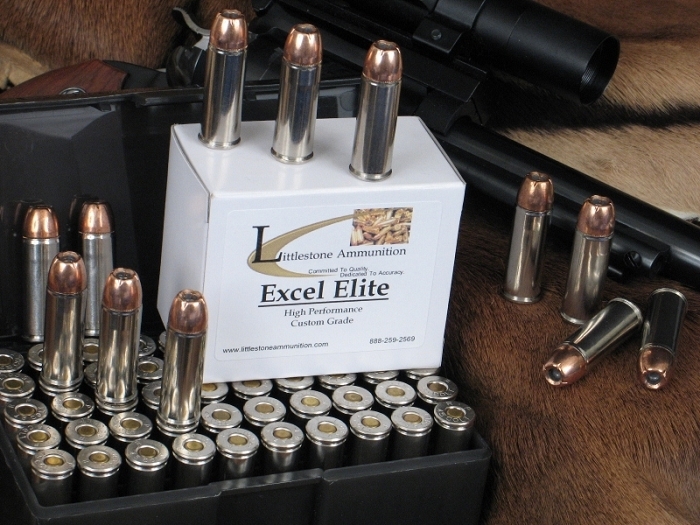 A generic photograph of 20- and 50-round boxes of one of Littlestone Ammunition's loading of the .45 Colt +P cartridge with 240-grain Hornady XTP-MAG Jacketed Hollow Point bullets. Hover cursor or click on photo for close-up view. Firearm not included. Want some "eXtreme Terminal Performance" from your .45 Colt +P hunting revolver? Load up with Littlestone Ammunition?s high velocity .45 Colt +P cartridge featuring Hornady's XTP-MAG hollow point bullet. This 50-round box features 240-grain bullets with a muzzle velocity of 1,460 fps and 1,136 ft pounds of energy. The MAG is a version of the XTP designed for higher velocities. It is a jacketed, lead core bullet and it shares with the exceptional accuracy and high weight retention for which the standard XTP is known. In fact, the XTP's accuracy is such that it is the bullet of choice of some world champion competition shooters. The MAG version is a big-bore pistol bullet design that will insure the deep reliable penetration that handgun hunters want. It is a reliable, value-packed round that performs well for those who use it. If you want a solid, dependable load for your .45 Colt +P, this would be a superior and highly effective choice. Feature 3: MV / Energy / Barrel: 1,460 fps / 1,136 ft lbs / 7.5"